This post is sponsored by House Foods Tofu. 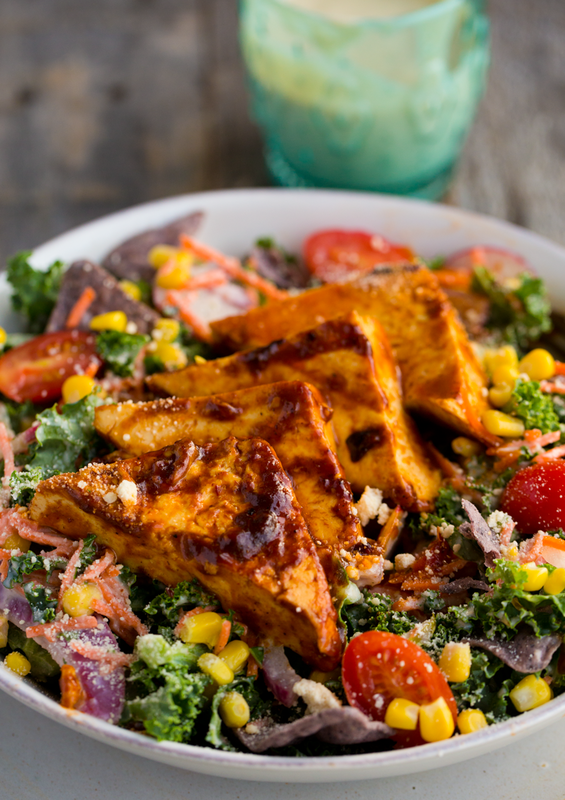 Today's BBQ Tofu Corn Kale Ranch Salad is a meal in a bowl! 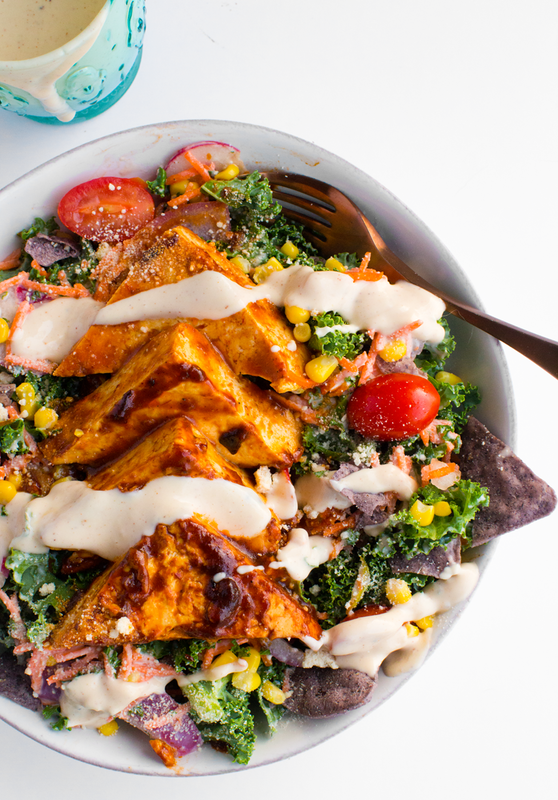 This entree salad is loaded with healthy ingredients like kale, corn, carrots and of course hearty BBQ skillet tofu triangles on top and creamy silken tofu ranch dressing to make everything extra amazing. This country style salad is a delicious and easy dinner option for you and your family. These flavors will impress!.. 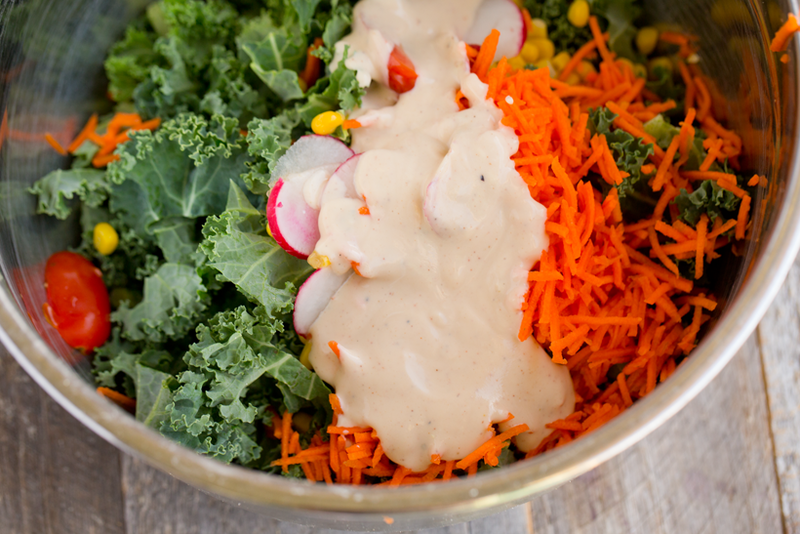 This Tofu Ranch Dressing is so good! 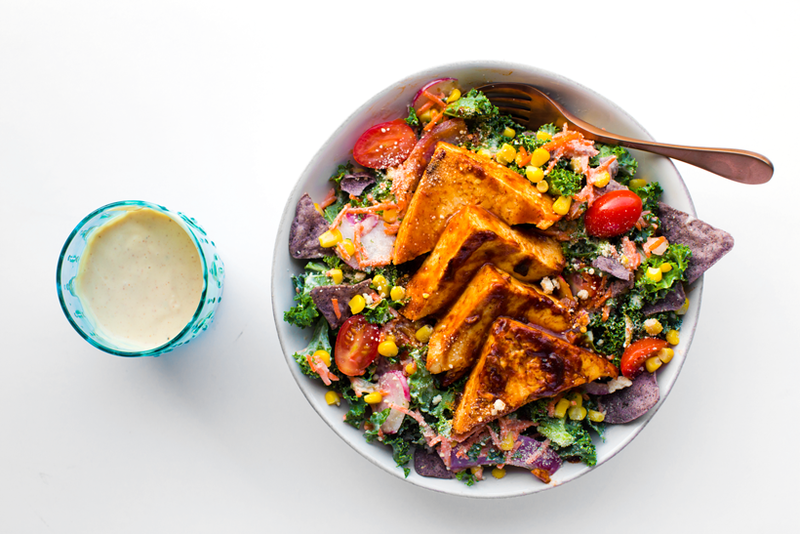 Rich and creamy with a punch of plant-based protein.. Sauce and toss! 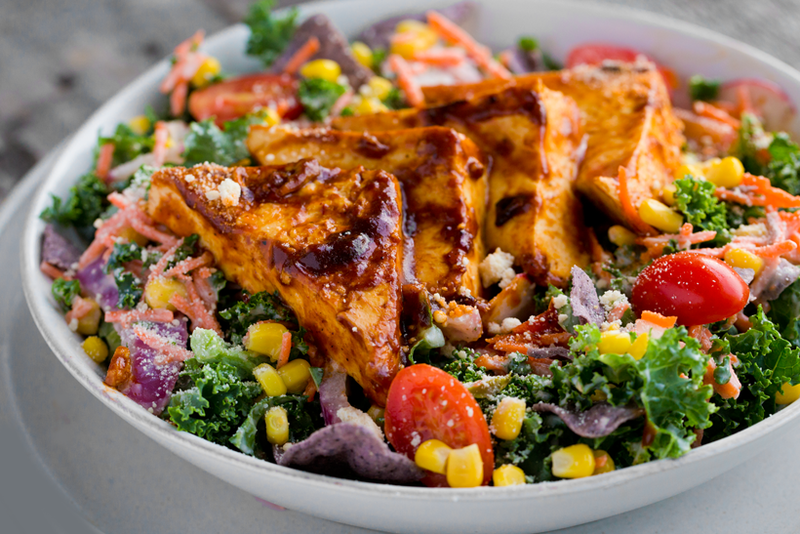 For a creamier salad, be generous with your dressing..
Sticky-sweet BBQ tofu on top for protein and flavor. I also added a sprinkle of vegan Parm topping. Drizzle on an extra coating of ranch if you want!.. Today's state in the House Foods 50 plates of tofu series: Nebraska! When I think of Nebraska I think of rolling fields, endless miles of countryside, corn fields and sunshine. 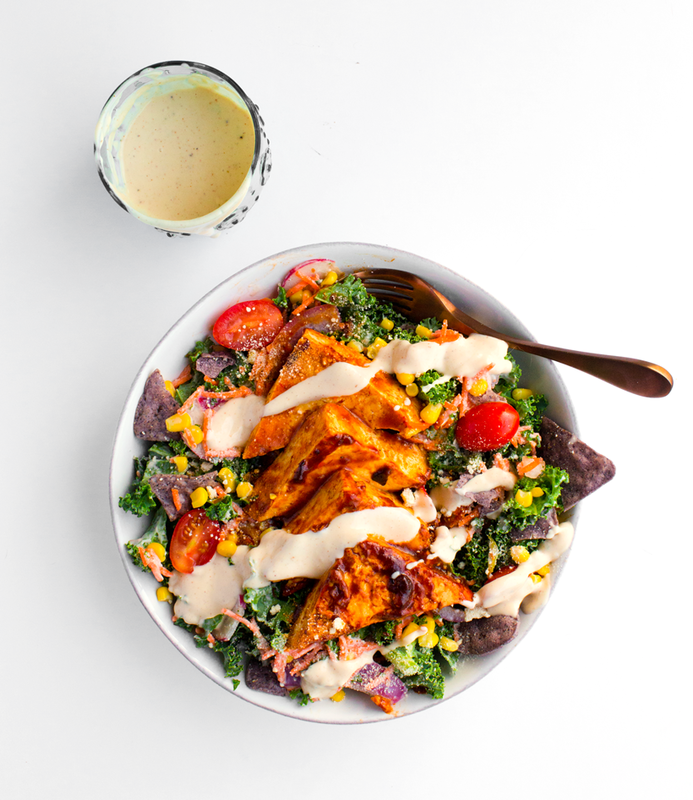 Enter in giant country-style salads with creamy ranch on top. 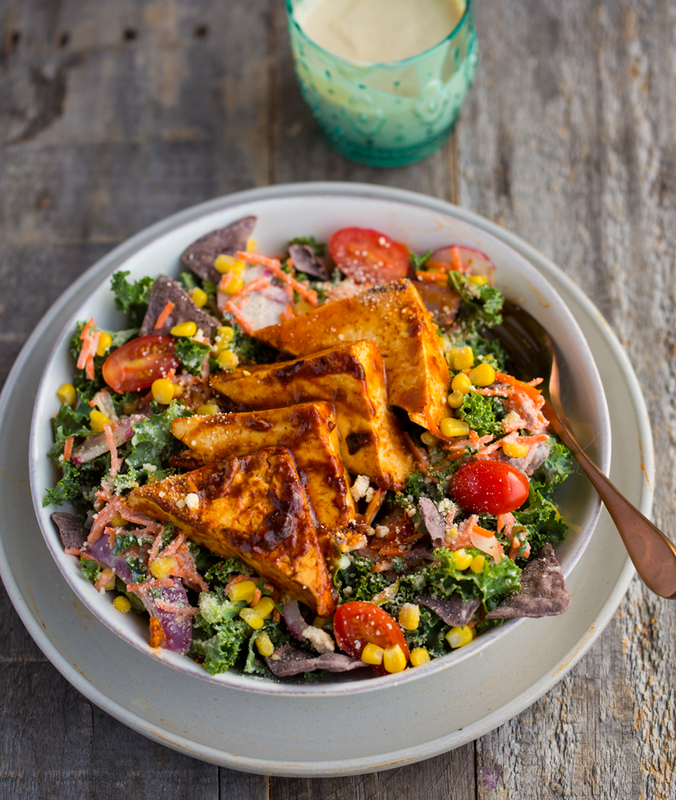 This country-inspired, rustic BBQ tofu salad combines delicious triangles of skillet tofu - all sticky and sweet - with a homemade vegan ranch dressing, made using silken tofu. The salad contains kale, Nebraska-inspired corn, radishes, grated carrots and a few fresh tomatoes. 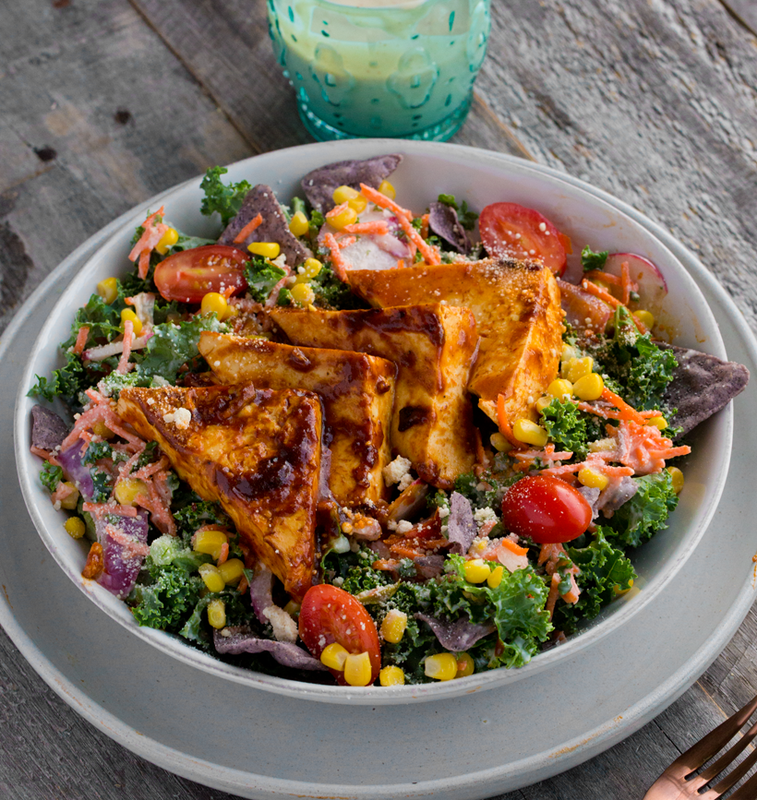 BBQ Tofu Triangles and a veggie-filled salad combines with vegan ranch dressing for a delicious entree bowl. 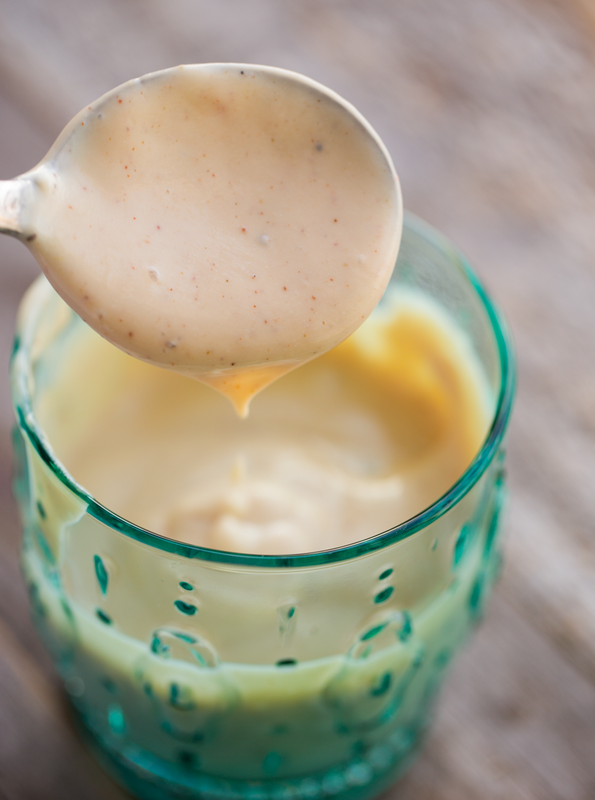 Add all the dressing ingredients to a blender and blend from low to high until smooth. Pour into a medium glass jar or cup. Cover and place in the fridge until needed. Prep the tofu by draining excess liquid from container, and patting the tofu dry with a paper towel or clean dish towel. 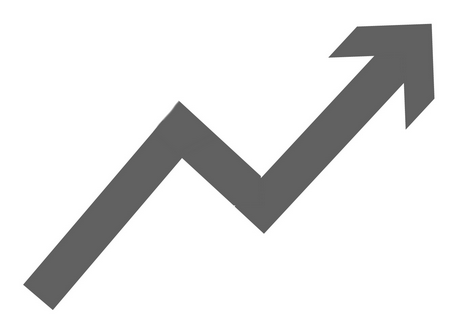 Slice into triangles or cubes. Warm a large skillet over high heat. Add the two teaspoons extra virgin olive oil. When oil is hot, add the tofu. Shake the tofu in the pan and cook for two minutes, then add the BBQ sauce over top the tofu. Cover pan with lid or a sheet of foil and reduce heat to medium. Cook for 2-3 minutes more. Flip tofu and keep cooking until the BBQ sauce becomes sticky and coats the tofu. Turn off heat and let the tofu rest in the pan for at least three minutes before adding to salads. Kale prep. Rinse the kale leaves, then remove the thick stems of the kale, leaving only the curly leaves. Using a knife (not everyone has a “chef’s knife”), chop the kale leaves. Rinse and drain one more time. Set aside. For extra dry leaves, squeeze excess moisture out with a paper towel. Salad: In a large mixing bowl, add the kale, corn, radishes and carrots. Also add about ¼ cup of dressing. Toss well until all the ingredients are coated. You can add more or less dressing at this stage if you prefer. Add in the corn chips and a few sprinkles of vegan Parm and lightly toss again. 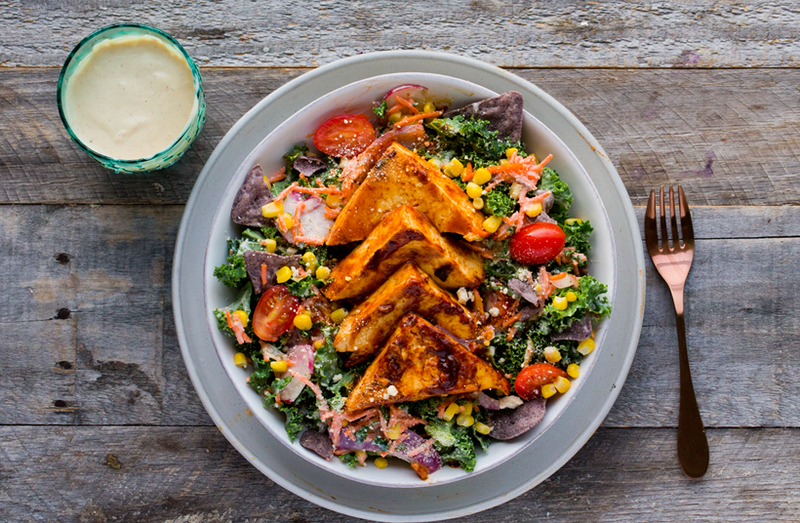 Pour the tossed salad into serving bowls and top with the BBQ skillet tofu. Add more chips and vegan Parmesan if desired. Serve! Follow along on the House Foods Facebook Page. disclosure: this post is sponsored by House Foods Tofu's 50 Plates Series, but all opinions are my own.